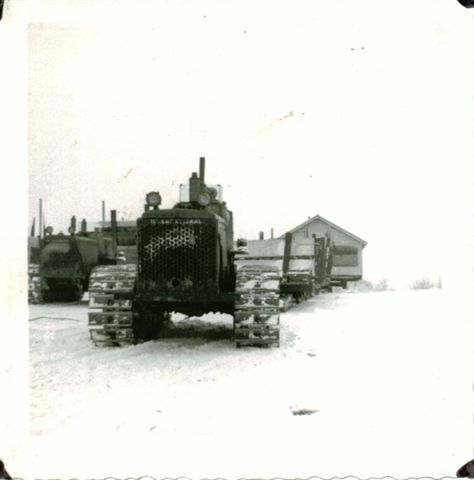 IN 1949 THE FIRST HOUSE FROM SHERRIDON, MB WAS SLEIGHED TO LYNN LAKE, MB AS A TEST RUN OVER THE 160 MILES OF CAT TRAIN TRAILS. OVER THE NEXT 3 YEARS, 208 BUILDINGS WERE MOVED TO LYNN LAKE, MB FROM SHERRIDON, MB AS PART OF THE TOWN THAT MOVED. WHEN YOU THINK ABOUT HOW THEY DID SUCH AMAZING FEAT 50 YEARS AGO IT IS MIND BOGGLING. I THOUGHT THE HOUSES WERE TOWED RIGHT BEHIND THE CAT ON STONE BOAT SLEDS. BUT THAT IS NOT HOW IT WAS DONE. THEN TO SEE PICTURES OF THEM 3-4 SLEIGHS BACK FROM THE CAT AND UP ON THE REGULAR WINTER FREIGHTING SLEIGH IS UNREAL. OF COURSE PICTURES DO TELL A THOUSAND WORDS BUT WE HAVE DECIDED TO RELIVE THE MOVING OF THE HOUSES ON THE TRICYCLE SLEIGH DESIGN. WE HAVE BOUGHT 3 HOUSES IN THE TOWN OF LYNN LAKE, MB TO MOUNT THEM ON THE SLEIGHS LIKE THEY CAME TO LYNN LAKE, MB 50 YEARS AGO. ONE OF THE THINGS THAT SETS US APART FROM BEING A MUSEUM DISPLAY IS THE FACT THAT WE WILL DRAG THE HOUSES THROUGH THE BUSH ON THE CAT TRAIN TRAILS. TO MAKE IT EVEN BETTER IS THE FACT THAT THESE HOUSES WILL BE PART OF THE CAT TRAIN TOURS. CLICK ON THE FOLLOWING LINKS TO SEE THE HOUSES AS WE BOUGHT THEM AND HOW THEY GET TO BECOME HISTORICAL HOUSE SLEIGHS.